In the fall of 1932, WSU transitioned to a four-year course of study for pharmacy, from a two-year program. 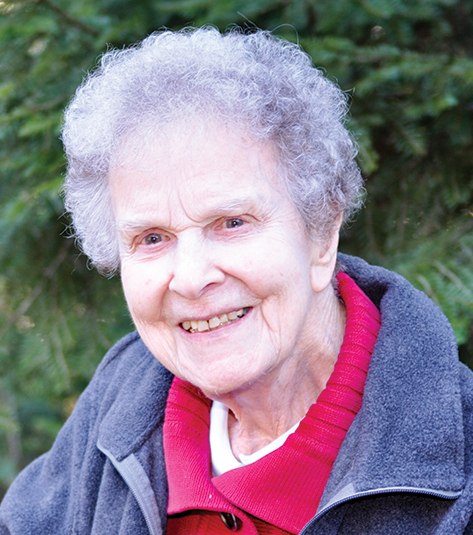 One hundred-year-old Geraldine (Jeri) Kerr, B. Pharm., of Newport was part of the first graduating class of the Bachelor of Science in Pharmacy degree four years later. Kerr (left), one of three women in the program, was fascinated by the experiments in her pharmacy labs. She especially liked the hands-on aspects of pharmaceutical compounding. Along with lessons in quantitative analysis, Kerr studied materia medica (which is learning the source of drugs), identification of plants, and dosages of drugs. Due to the rigorous course of study, students interested in the pharmacy program had to declare their major the day they enrolled. Pharmacy had its start at WSU much earlier than Kerr’s arrival, being one of the first four areas of study approved by the WSU Board of Regents in 1891. In 1892 the first pharmacy course was offered as part of the chemistry department at the fledgling Washington State Agricultural College. Both the college and the profession of pharmacy have come a long way since those early days. Washington’s first Pharmacy Act passed in 1890 formalizing registration requirements for those wishing to “retail, compound or dispense drugs, medicines or poisons.” Now pharmacists obtain a doctoral degree focused on drug knowledge and expertise, and complete minimum requirements for practice experience before sitting for their North American Pharmacist Licensure Examination to become a licensed health care practitioner. The College of Pharmacy is a graduate and professional education college. Its degree programs include the Doctor of Pharmacy (Pharm.D.) and Doctorate in Pharmaceutical Sciences (Ph.D.). The college has been accredited since 1912. The Ph.D. program prepares pharmaceutical scientists dedicated to the promotion of human health and wellness for careers such as academia, industry, health care, or private institutions. Training new pharmaceutical scientists contributes to the college’s position as a leader in collaborative research and scholarship, and educator of outstanding health care professionals and scientists. Research areas of emphasis include cancer biology, drug discovery and translational pharmacology (taking the science of drug research and incorporating it into innovations in medical practice to improve human health). The Accreditation Council for Pharmacy Education-accredited Pharm.D. program prepares pharmacists to provide patient care in multiple health care settings. The program emphasizes patient-centered care, drug therapy and disease state management, and interprofessional team collaboration. The Pharm.D. program is offered at the WSU Health Sciences campus in Spokane, and at an extension location in Yakima on the Pacific Northwest University of Health Sciences campus, which opened in August 2013. The College of Pharmacy established a presence in Yakima in the 1990s. It has long been a practice site for WSU student pharmacists completing their fourth-year Advanced Pharmacy Practice Experience rotations. The last year of pharmacy school is dedicated to six rotations, much like the way medical students complete clerkships in their third and fourth years of medical school. 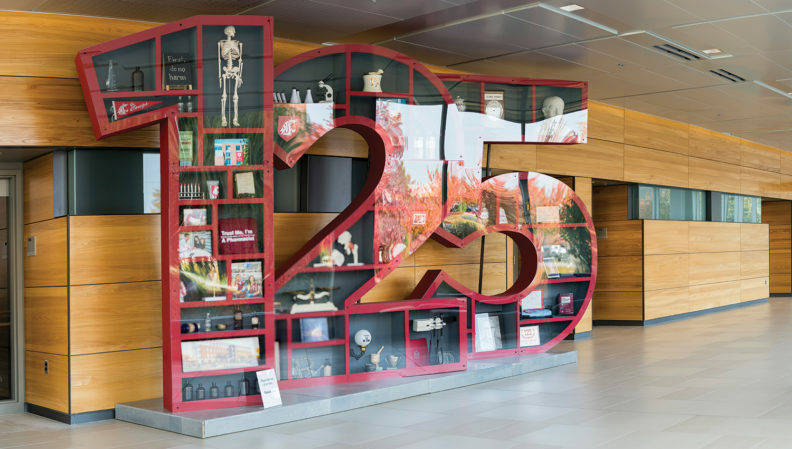 The college relocated from Pullman to Spokane in December 2013, but has been heavily involved in the Spokane health care community since the 1970s through internships, experiential rotations, and pharmacy residency programs. It currently has more than 500 student pharmacists and graduate students, and nearly 3,000 alumni. The college has a legacy for developing health care professionals who go on to become leaders in the profession. In the 1970s, White wrote that the future of pharmacy lay in the hands of those with the entrepreneurial spirit and vision of innovation to bring the practice of pharmacy into alignment with the needs of an evolving health care practice environment. These words still ring true today. Since 1979, pharmacists in Washington state have enjoyed the ability, if he or she chose, to partner with a physician to prescribe under collaborative drug therapy agreements, which allows pharmacists to provide services that are much needed in the rural and underserved areas of our state. Within these local communities is where the pharmacist, as a care provider, has the greatest impact on population health. Today, every WSU pharmacy graduate carries the expertise, skills and potential to be a decision maker and leader within their health care community. Under the leadership of Dean Gary Pollack, Ph.D., the college has seen some important milestones including the consolidation of its headquarters in Spokane, the transition to comprehensive competency-based assessment of student performance with the honors-satisfactory-fail grading system, and its current transition to an active- and collaborative-learning approach for delivering its Pharm.D. curriculum. The college officially celebrated its 125th birthday with an anniversary gala on November 4. The main goal of these anniversary activities was to reinforce and elevate the college as a leader in collaborative research and scholarship, and educator of outstanding health care professionals and scientists. In addition to this effort, the college established a special endowment that will “live on” to help influence the next 125 years of the college’s history: the Dean’s Endowed Professorship. This fund acknowledges the excellence of past, present and future deans of the college and will be used by the dean to advance strategic initiatives supporting the practice of pharmacy and help position the college for the future as a top-tier pharmacy school. 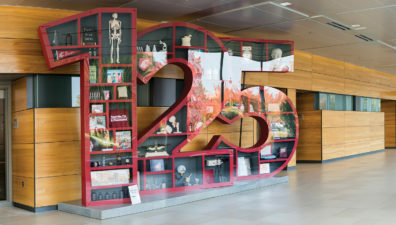 The successful history the College of Pharmacy celebrates this year would not have been possible without its many alumni, community partners and donors. Thanks to these many collaborators, the college continues toward its vision to be a leader in protecting, promoting and improving human health, and contributing to the health care solutions of the future. For more information go to pharmacy.wsu.edu/125.